THOMAS HARLAND was born 19 July 1762, son of the farmer and butcherWilliam Harland and Ann Dickinson. He was christened in Whitby on 29 August 1762. He and his twin sister Margaret were the third of eight children. Margaret died the following year. Thomas was born in Hawsker, a village four miles SE of Whitby, near the coast. When he was about five, the family moved to Knipshaw. This has not been identified, but was probably nearby. He made a significant change from his father’s occupation to become a cabinet-maker in Whitby. ESTHER WARDALE was probably the daughter of William and Mary Wardale. Her age when she died suggests she was born around 1759. The most likely baptism is in Brotton, 14 miles NW of Whitby up the coast road. Esther, daughter of William and Mary Harland was baptised on 13 April 1760. She was the fourth of five children. Thomas and Esther married at St Mary’s, Whitby, 5 May 1782. Thomas signs the register, but Esther makes her mark X.
Thomas is a Batchelor and Cabt maker. St Mary’s is a remarkable church. It stands on the cliff above the harbour, just below the Benedictine ruins, which are themselves on the site of the mixed Anglo-Saxon abbey founded by St Hilda in the 7th century. It was of Norman origin, but was substantially remodelled in the late 18th century. 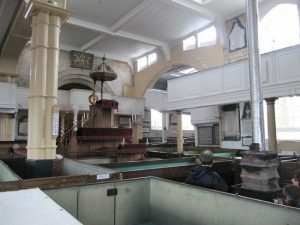 Instead of rows of pews, St Mary’s has box-like stalls around three sides of the pulpit, with a gallery above them, making it more like a non-conformist chapel. Many of the gravestones in the churchyard have been so eroded by salt wind as to be indecipherable. The couple had seven children baptised in Whitby. She was buried on 4 Jan 1787, aged 10m. She may be the Mary Harland who was buried on 31 Mar 1824, aged 25. For some reason, Mary and William Wardale were not baptised until the birth of their brother Mathew, when Mary was 6 and William Wardale 4. The family may have drifted away from the church, though it was still unusual for a child not to be baptised. Or they may have attended a dissenting chapel for a time, and had Mary and William Wardale baptised there. If they returned to the Church of England, they may have been persuaded by the rector that a second baptism was necessary to regularise the position. Richard became a flax dresser and moved to Mickley, on the far side of the North York Moors. There is a death in in 1837 for Esther Harland of Church St, Whitby. She was buried on 17 Aug, aged 78. Thomas’s death has not been identified.